Much of the Midwest, South, and now the West has been ravaged by tornadoes and flooding, leaving widespread devastation in their path. As the toll from these storms rise along with the floodwaters, residents, including IAM members, in these areas of the country are far from being clear from danger. Please consider our members and their communities that have been affected by these storms and flooding. Any donation to the IAM Disaster Relief Fund is greatly appreciated. If you are considering donating to the IAM Disaster Relief Fund, click here. You can donate by mailing a check directly to: IAM Retirees, Community and Membership Services Department, Room 305, 9000 Machinists Place, Upper Marlboro, MD 20772. The IAM Disaster Relief Fund provides help in situations where our members and their families endure hardships due to natural disasters. 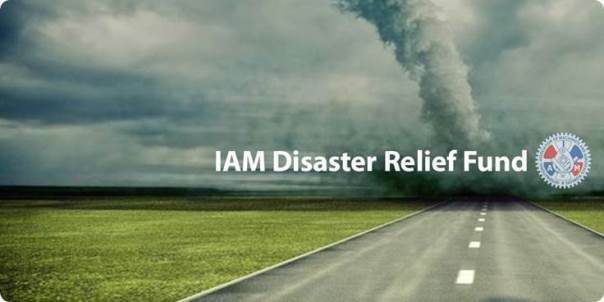 All donations made to the IAM Disaster Relief Fund are tax deductible. If you have questions, please contact Edward Manhart, Director of the IAM’s Retirees, Community and Membership Services Department, at emanhart@iamaw.org or 301-967-3433.